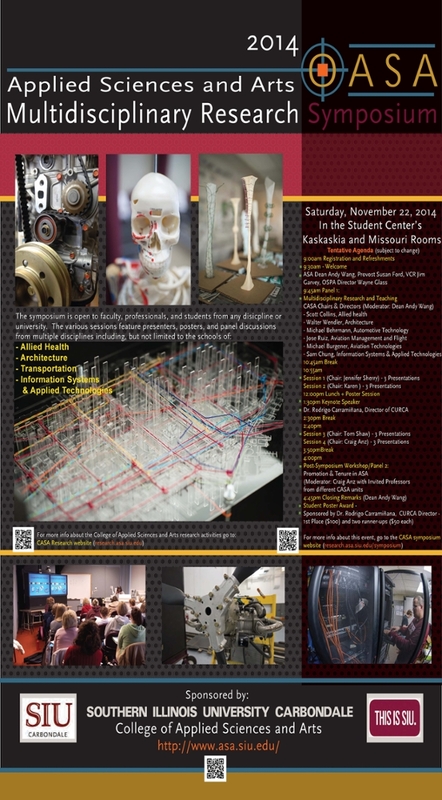 Though the 2014 ASA Research Symposium has come to an end, the College will continue to support research and creativity. During 2015 Summer, the College will fund another six research projects. The proposal deadline is in the middle of March. AND the inaugural issue of Journal of Applied Sciences and Arts is accepting paper now until the middle of January. Submissions can be sent to jasa@siu.edu. See the Journal of ASA page for further information. A Comparison of Contents Management Systems for Beginners by Paul Seonguk Heo (Computer Science) working with Dr. Sam Chung. A Clinical Decision Support System for Tobacco Intervention Using Electronic Health Records by Geovane Piccinin (Information Systems Technologies), Alex Glasnovich (Information Systems Technologies), and Alireza Khamesipour (Electrical and Computer Engineering) working with Dr. Andrey Soaresand Dr. Joan M. Davis. Working towards a Small and Efficient Turbine Engine by Wilson Meador (Aviation Technologies) working with Don Morris. Consumers’ Attitudes Towards Fashion Mobile Shopping by Marcella Smith (Fashion Design Merchandising) working with Dr. Seung-Hee Lee. SIU University Housing Web Application Development with an Agile Project Management Methodology and Refactoring Methods by Adam Woodworth (Information Systems Technologies) working with Dr. Sam Chung.